24 MAY 2016 COATINGSPROMAG.COM Marketing Savvy Marketing Savvy A lmost every morning when commuting, I see this one truck. I've seen it on the east side of town, as well as on the west, north, south. I've seen it both moving and parked. It's always clean, and it's got a nice decal wrap that I can describe from memory: Te wrap shows colorful fames and ice cubes down by the wheels, and the rest of the truck is white. Wording on the side lists heating, ventilation, and air condition- ing (HVAC), refrigeration, and a few other services, and the company logo draws attention with a clock and the words "24" and " Tech." At some point after seeing this truck enough times, I Googled the company to learn what it is all about. Now I know the name and what services the company provides. W hen the time comes that I or someone in my life needs one of those services, you can bet that this company will be the frst one I look up. And that, of course, is how brand- ing works. At least familiarizing your customer base with your company is part of branding. 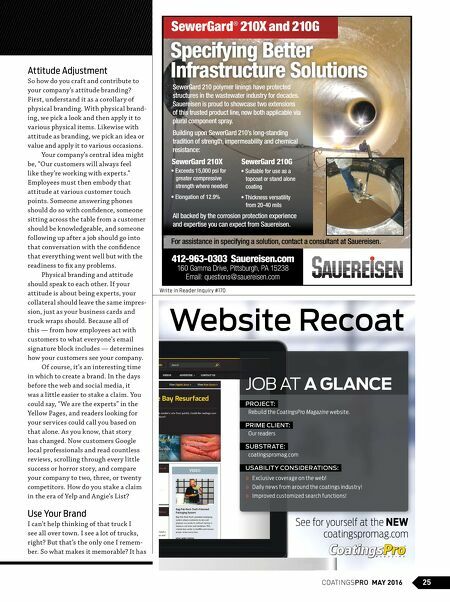 Specifcally, it's the part I trust you already know as a coatings contractor. Most companies think of branding as something to look at: truck wraps, websites, business cards, apparel, email signature blocks, advertise- ments, collateral, and so on. And you'd be right. A ll are important occasions for branding — a chance to create a uniform look so that people recog- nize your truck out of the hundreds of trucks they see that morning, for example, or your ad out of the dozens of ads they see in magazines. Tis kind of branding takes as much time and money as you give it — which means it can also take little of each — and it's easy enough to master. You create a look frst, and then you decide how it applies to tri-fold brochures, clipboards, polo shirts, etc. But branding isn't always visible, especially given that it's also about attitude. Attitude is arguably even more important than look-based branding because it embodies ever y- thing your company does and how you do it — all of which is perceived by customers and affects their experi- ences. Attitude, after all, is part of how we answer the phone, how we speak when we sit across the table from a customer, how we follow up after a job, and so on. Attitude is arguably even more important than look-based branding because it embodies ever ything your company does and how you do it — all of which is perceived by customers and affects their experiences. 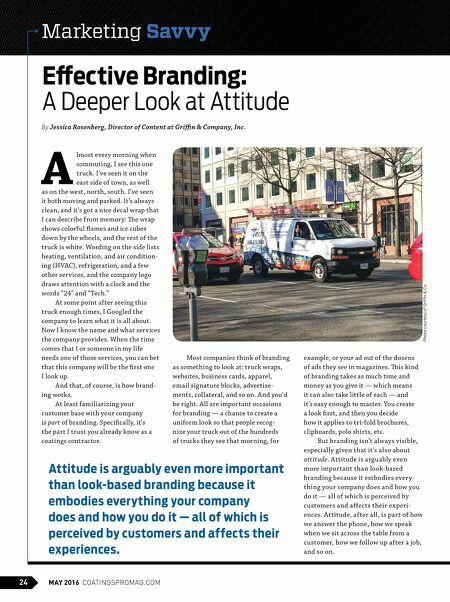 By Jessica Rosenberg, Director of Content at Grifn & Company, Inc. Efective Branding: A Deeper Look at Attitude Photo courtesy of Griffin & Co.